Get ready for another nostalgia-filled episode that also offers the first glimpse of beloved chief of surgery Miranda Bailey’s life pre-Seattle Grace internship. The walk down memory lane was surprising and felt oddly timed. However, you can’t complain about a Bailey-centric episode! Several themes also emerge that play well with the direction the show has been going in, and there’s no better time than the present to give these issues a big spotlight. Grey’s Anatomy has always been about strong female characters taking charge, holding their own, and leading the show. While Meredith is the central focus of the series, it is easy to argue that the toughest female character on the show has always been Bailey. Her tough-as-nails demeanor strikes fear, admiration, and respect into her colleagues and patients alike. However, not everyone always takes her seriously. After stating that she has indigestion on her way to work, Bailey asks Ben to drop her off at Seattle Presbyterian and lies about having a meeting. She tells the ER nurse that she is having a heart attack. The intern evaluating her doesn’t think she is though, and neither does the chief of surgery, Dr. Maxwell, whom Bailey calls for another opinion. Bailey wants a cardiac stress test to prove that she is having a heart attack and argues with Maxwell that he clearly doesn’t know that heart attacks present differently in males and females. Maxwell feels that a normal EKG and Bailey’s history of mental illness (remember that breakdown a few years back when she was diagnosed with OCD?) mean that she is feigning symptoms. Bailey calls Maxwell out for dismissing her self-diagnosis, stating that he is clearly judging her as a woman, person of color, and that mental illness doesn’t define a person. Yes, Bailey has had a lot of stressors in her life this season, but she argues that that doesn’t mean her symptoms are fake. No matter what is thrown at her, Bailey always stands her ground and fights for what she believes is right. It is inspiring to watch Bailey try to improve men’s thoughts of women one speech at a time. Bailey is right to be angry that a man is dismissing her and not even taking into account that she too is a chief of surgery and definitely knows the symptoms of a heart attack. The demeaning of women by men who think they are better than everyone else continues when Bailey calls Maggie and asks her to come to Seattle Presbyterian to give her a second opinion workup. When Maggie arrives, Bailey does in fact have a heart attack, which could have been prevented if Maxwell had listened to her. Maggie gets a couple of great choice words in several times during her scenes. Maggie doesn’t always stand up for herself or others, so it was good to see her step up for a change. She calls Maxwell out for the same things Bailey did, which helped drive the point home. Maggie gets the final laugh when Bailey’s stint fails and needs surgery, which Maxwell doesn’t know how to perform the simpler version of. The show has been doubling down on adding current problems in America to its dialogue lately, so it’s no surprise that we now get to see a full narrative about women not being taken seriously. This is a huge problem in American society, and there’s no reason why women shouldn’t be respected by men. 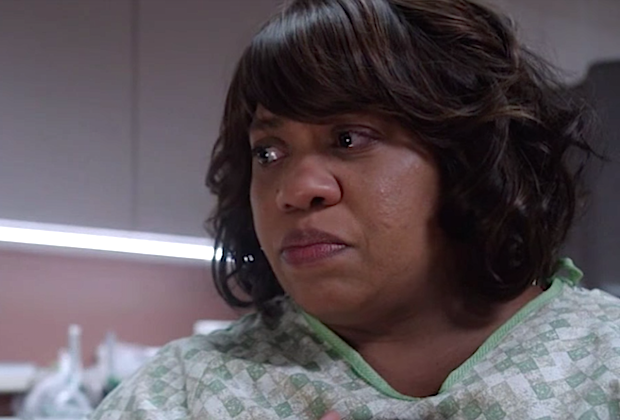 Bailey makes the best point of the episode when she tells Richard about how hard it was for her to become chief of surgery and that she can’t let anyone know she had a heart attack because they will use it against her as a weakness and potentially try to overthrow her. It’s sad that society has yet to change, but it’s important that this issue continues to be discussed so that change can happen. Throughout the episode, Bailey flashes back to some pivotal moments. The flashbacks are a bit odd because the show typically only does this during a major moment like a character’s imminent death or departure. Bailey thankfully does survive the episode, and it was nice to learn about her past. Before this episode, we have only seen Bailey from the time she became one of Richard’s interns in flashbacks. There has never been any mention of her family or past, which is weird considering that all the other characters have rich backstories. Bailey lived a simple life with her parents. She seemed to be burdened as a child by her overprotective mother, who we learn acted this way because she had another daughter before Bailey who died at two months old. Bailey’s mom always wanted to keep her safe and alive, but this held Bailey back. This explains a bit why Bailey is stubborn, tough, uptight, and always fights for what she believes in. It’s clear that her mom was a huge influence on her, even though she probably doesn’t realize it. While there isn’t too much substance in these flashbacks, it is nice to learn more about Bailey and why she is the way she is. The more surprising flashbacks came in the form of archive footage of Bailey’s best moments of the series. This is a surprise because the show rarely shows past footage for flashbacks or at all for that matter. The bigger shocker is that some of the archive clips include George, Derek, and Callie. Grey’s may talk about their dead characters and the ones who left, but we never get to see clips of those who are no longer on the show. Grey’s Anatomy likes to keep it in the present and only show their current cast, so I was very surprised to see the mold be broken in an episode that didn’t feature a character leaving or dying. At least it was a nice walk down memory lane for fans!